If we fight, we might lose. If we don't fight, we've already lost. What are Shards? What are Anomalies? Why do I care? The Resistance and Enlightened factions battle worldwide during anomalies. The anomalies not only provide a sense of collective pride and team cohesion, but also (theoretically anyway) affect the Ingress storyline. They’re also a great way to get out and have fun, meet new players and explore new places with friends (carpooling can be fun!). Ever wanted to establish relationships with agents in new states and new areas? Travel to an anomaly site and get social! This is where many contacts are made on both sides that can result in lasting friendships, and hopefully, lots of frogtears when you plan operations together! But first, how are they scored? Points scored at ground events: The way these events are scored varies by series but generally dominating the other faction on the ground matters here. Typically there are several of these events during the series, grouped into a few weeks with a week or more off in between. Primary Sites: These are the sites with all the attention. Typically scoring at these sites is worth twice the satellite sites, and are usually well attended by Niantic representatives, often feature the #NL1331 ingress van featured on the ingress.com website’s front page, and typically have special missions, special events (like GoRuck) and the announcement of new in game items and extravagant after parties completely funded by Niantic. Typically non player characters such as Hank Johnson, Klue, and Susanna Moyer attend these if the storyline demands it rather than satellite sites. Scoring for these varies widely (during Helios, a control field over the entire cluster meant a 40% bonus for the team who threw the control field, whereas with Shonin the control field was over “strategic field markers” (specially chosen portals in cluster) and scoring was 100+ points, which during that series was nearly impossible to overcome on the ground. The way anomalies are set up is consistent across series. Niantic and the local faction leads work together* to come up with groups of portals that make sense to play together. They aim for safe*, walkable* and fun* areas that feature the city’s interesting points (* how well this works varies widely depending on the level of NIA cooperation with local site contacts). Typically 4 clusters are chosen. The game is played for 4 hours, one hour in each cluster. For each cluster, a measurement period of 10 minutes (varies sometimes by anomaly) occurs at the top of the hour. Niantic publishes a hashed measurement time during this 10 minutes when the game is freeze framed and scored. They publish the salt for the hash with the scores so you can independently verify the time was chosen in advance. This period is called “measurement” and you don’t know it’s happening other than “sometime during the measurement window”. These are either scored over the course of a week (Helios) or are scored during the same interval as their associated primary site. Shards/Artifacts: Basically the way they work is that the shards move every (period defined by niantic, has varied between 2 hours and 12 hours in different series, but the jump interval is typically fixed once announced). They will move along links between L7 portals at these times. The combined total of these (the scoring of them, and their influence in the series varies by series) work out to the total faction score for the anomalies. How do you find out the rules? Much like everything else in Ingress, it’s left for you to discover. Hints are everywhere. Sometime’s it’s hackable media (or media using encoded passcodes hidden in Niantic videos (watch the ingress report very carefully, you’ll see numbers flash and stuff, those are coded passcodes, sometimes they just hold gear, sometimes they hold media that contain hints of future events!)). IQTech Research addresses primarily scoring and status things. Hulong Transglobal addresses intel map updates, scoring details, and other statistics. Some of these players are “deceased” within the game. Calvin ball is a thing, and it’s worth circling them all to watch for intel just in case. Many of the most active characters here were once thought dead at one time and a deus ex machina is pretty much a given. 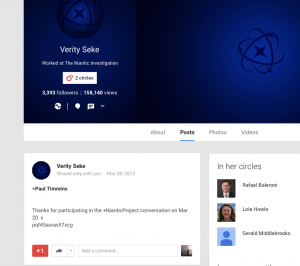 One more name you should know: Verity Seke. 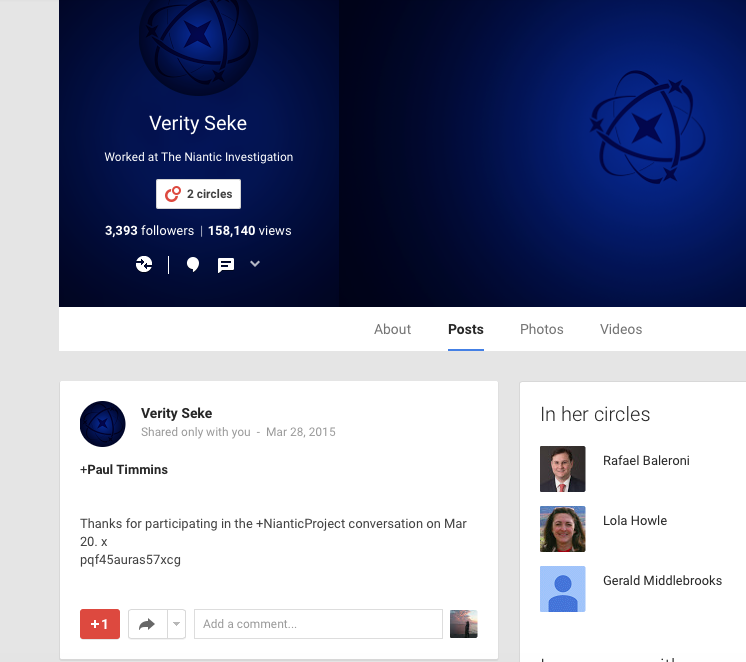 This account acts as overwatch on the discussion thread of the non player character G+ accounts, and if you make constructive comments, Verity will occasionally post one use passcodes to you via private G+ posts for gear. These are rewards for you, and are single use redeem. Often invisible blank characters are stuck on the end of these. If it says “Invalid Passcode” try backspacing at the end, or at worse retyping it.